The peso fluctuates in value beween 9-10 pesos to 1 US dollar. Banks generally have the best exchange rates & open at 8:30am or 9:00am, make sure you check what hours they do money exchanges. In addition there are private money exchanges or "casa de cambios" that stay open longer, offering slightly less favorable rates than banks, but the convenience of a quick transaction at almost any time of the day or night. Most banks may have 24 hour teller machines that allow you to take cash advances on your credit cards, or even ATM cards - paid in pesos. However, at times the ATM machines may have communication problems with banks in the US or Canada, and consequently may not respond to your needs precisely when you need them. Most of the larger establishments - from restaurants to shops, will readily accept US currency. The issue in that case will be the exchange rate that they offer; it is advisable to ask first in order to avoid any disappointments. Also, whether paying in Dollars or in Pesos, it is a good idea to carry small bills with you, as it is often difficult for small shops or stands to make change for large bills. This is certainly true as you travel to the more remote parts of the island. Most of the hotels, resorts and more upscale restaurants and shops will accept credit cards, with some or no surcharge. However, you have to keep in mind that many other establishments - especially smaller ones with lower prices - do not accept credit cards. While you are planning your trip, make sure that you carry - or have access to, enough cash or traveller's checks. La Paz is in the Mountain Time Zone. It is said that the pace of life is generally slower in Mexico. At times it is true! Due to the hot temperatures in summer months, the residents of this area (Mexicans and Non-Mexicans alike) have learned to slow down and pace themselves - especially when working outside under the sun. Siesta or the mid-day break is a tradition that reflects the necessity of avoiding heat-related fatigue or the afternoon rains. It coincides with the hottest time of day when people retreat to their homes to eat and rest in the shade. You may see businesses closed for "siesta" ranging anywhere between 1:30 pm to 4 pm, while being open till at least 7:00 pm afterwards. However, the growth of the Mexico's resort areas is changing this tradition rapidly. More and more businesses are now opting for a "9 to 5" approach, eliminating the "siesta" times. You can call (direct dialing) and fax to anywhere in the world from La Paz, using the facilities at your hotel or a phone casita (telephone calling shop). Major US long distance companies have also established Mexican 800 numbers for making calls charged to "calling cards". Internet access is now available in La Paz, and some hotels may have access availability for their customers. There are a number of internet cafes for the convenience of both tourists and locals alike. Rates do vary, but are generally in the range of $3-$4 per half hour. International flights arrive daily to La Paz. Marquéz de león International Airport (LAP) is located approximately 12 kilometers from downtown La Paz. The airport is equipped with a restaurant/snack bar, shops and car rentals. You will need a valid passport or your original birth certificate along with a valid photo ID such as a drivers license (US and Canada). It must be presented at the airline check-in. Once on the plane you will be given two forms to fill out - one for immigration (Tourist Visa) and another for customs. There are restrictions as to what you can bring to Mexico......Some of these restrictions are limits for "duty free" and some are absolute, such as fire arms without a permit (not to mention drugs). Most food items - especially plants, fruits and seeds. Cigars and cigarettes - over 20 packs per person may be subject to duty. Liquor and wine - over 2 bottles per person may be subject to duty. Controlled substances and drugs - a no no! Firearms - only for hunting and must obtain a permit from the Mexican Consulate in advance. The Immigration counter is your first stop after you disembark the plane. Here you will have to present your passport (or birth certificate) along with the Tourist Visa you filled out on the plane. Your tourist visa and passport will be stamped to make your arrival official. (You will need to keep your passport and tourist visa with you at all times while in Mexico - make copies in case you lose your originals) Next you'll proceed to the baggage claim area for your luggage. Customs is the last step, here you will need to have your Customs Declaration Form handy (the other form you were given on the plane). Recently Mexico adopted a "Red Light - Green Light" system for customs. If you have put "Nothing to declare" on this form, you will be asked to push a button....... If the light is green you can exit without inspection; if the light is red you will be subject to inspection. This is a random system, and therefore there is no way to know whether you will get a green or red light. Consequently you need to be honest on your Customs Declaration and declare anything over and above what is allowed, paying all applicable duties. If you do not, and are caught by a red light, the fines may be very steep. One note, Mexican customs officials may assume you know about the "Red Light - Green Light" system and not say a word. No problem, step up & push the button. Airport Transfer Rates are controlled and it is currently $10 per person one way in a colectivo (shared) van. Some hotels have shuttles for a lower cost. Inquire with the hotel. Return taxis run about $16. Car Rentals reservations can be made at the airport, before arriving or at some of the major hotels. Car rentals run from US$30-80 daily. Cars and scooters are available for rental. Ask if your price includes taxes and insurance. Also, if there is a discount for cash/travelers checks. Confirm your airline reservations at least 24 hours before your return date, and arrive at the airport at least one hour before your departure time. Please also note that when you are checking in at the airport, you will be asked to return your tourist visa to the airline, which will be returned to the Immigration Office. Most people who arrive by land have driven their car from the U.S. border to La Paz (San Diego to La Paz is about 900 miles). La Paz has all the facilities necessary to make your trip a memorable one. You'll find gas stations and mechanics throughout the town. Please remember, Mexican insurance is mandatory. Arriving by bus is another option. You can catch a bus from Tijuana directly to La Paz. The trip takes an estimated 22 hours. The main bus station, Central Camionera, is located at Calle Jalisco and Ave. Independencia. If you plan to sail to La Paz, you will need to follow all Mexican regulations for entering their territorial waters. Also, upon arriving at the marina or your anchorage, you'll need to submit your papers to the Captain of the Port for legal entry. Please contact the Mexican consulate nearest you for all boating regulations. 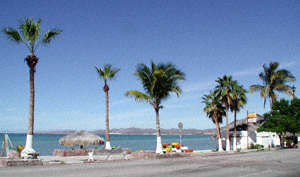 La Paz can also be reached by ferry from both Mazatlan and Topolobambo (near Los Mochis) both in Sinaloa. The ferry station is at Pichilingue located 10 miles outside town. Both auto and passenger service is available and reservations should be made if possible. SEMATUR runs the ferry system (Tel. (1) 122-9485). There are also some travel agencies in La Paz that may be able to make reservations for you. See Useful Links in General Information for the SEMATUR homepage. During your stay in La Paz transportation requirements will be dictated by where you are staying and where your intended destination is. Most of the time, you will have more than one option. La Paz is a modern city and most of the attractions center around the malecon (sideside walk) or the zocalo (main plaza) a couple blocks away. Taxis are plentiful, clean and reliable, and fares are reasonable and fixed. Taxis are usually lined up in front of hotels. Your hotel can call a taxi for you. If you plan to see areas outside the city central such as some of the beaches toward Pichilingue, taxi's can take you there, but make sure they know to return to pick you up. Rental cars and motorcycles are available from major rental car agencies. They have locations at the airport and in La Paz. Boat rentals are also available and some fisherman will take you to local beaches for a fee.